Ferretti Group CEO Alberto Galassi is shown with a model of the Aquariva Super that the group auctioned to raise money to support earthquake relief efforts in Italy. The charity auction was announced by Sir Elton John, who chose the exclusive “Blue Wonderful” color of the Aquariva, and Ferretti Group CEO Alberto Galassi during the Ferretti Group’s private preview in September in Monte Carlo. “Ferretti Group decided to create and auction a special edition of the Aquariva Super called &apos;Blue Wonderful,&apos; to which I give my personal contribution,” the singer said. “Our hearts go out to those who are still suffering, and we are confident that the auction proceeds will contribute to comfort and help to those who need it most." 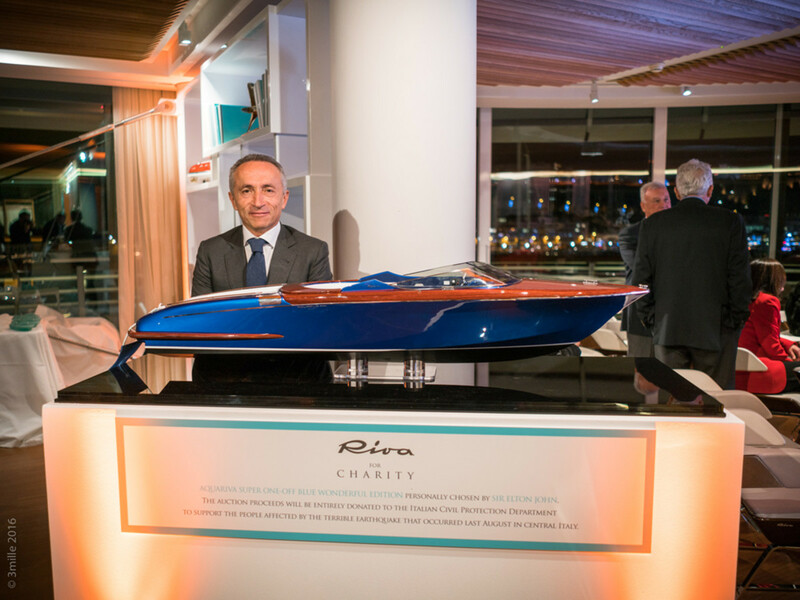 The charity auction ended Tuesday at the Yacht Club de Monaco during the Christmas cocktail organized by Monaco Boat Service, the exclusive Riva dealer for the principality of Monaco and France. The Aquariva Super "Blue Wonderful,” the only one with the color and interior elements selected with the contribution of the British pop star and Officina Italiana Design — the studio that exclusively creates the design of the brand Riva — went to an owner who asked to remain anonymous. The final and winning bid was 430,000 euros, plus tax (about $457,808.10 by today’s exchange). The proceeds will be donated to the Italian Civil Protection for immediate interventions to support the communities of central Italy that were hit by the earthquake. “The proceeds of this initiative will entirely go to the Italian Civil Protection to support immediate relief projects and support reconstruction of one of the most beautiful areas of the country, the richest in culture, history and traditions,” he said.